I pride myself on having taught in a blended classroom for the past few years. 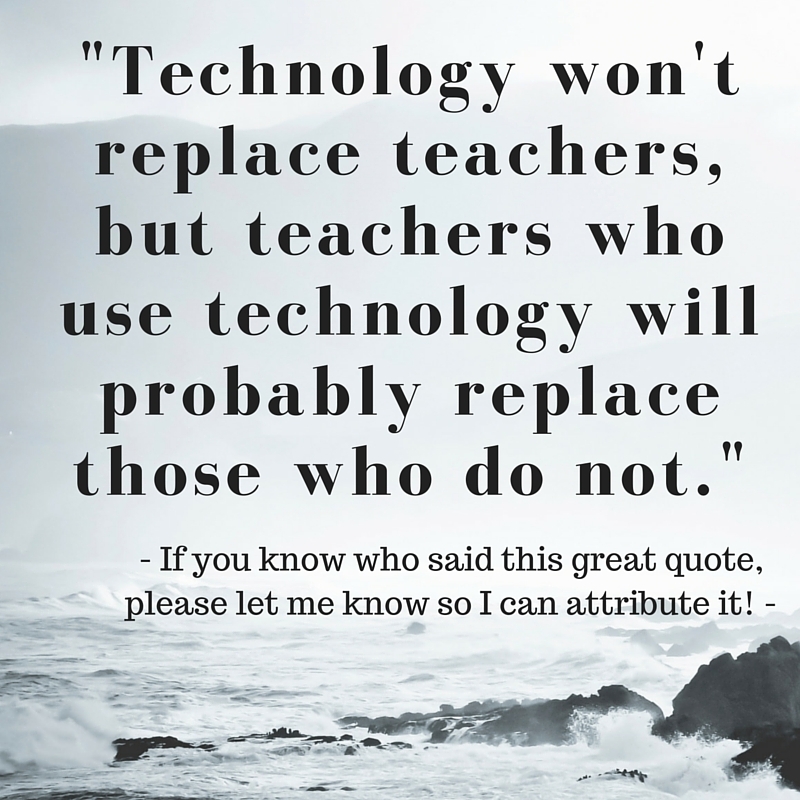 Without Google Apps, Chromebooks, and technology, my lessons wouldn’t be effective with their current design. But without me--the teacher--they wouldn’t be effective either. I struggle sometimes finding the balance between facetime and screentime, both in my classroom and home life--for me and students. That balance matters to me and I wouldn’t want to do one without the other. Technology clearly enhances and transforms my teaching and learning, but so do relationships, conversations, and real life interactions. Still, there are times when the flipped lesson or activity is a great tool to deliver content and shift instruction. By flipping the delivery of content to outside the classroom with technology, we can maximize instructional time and learning during our class period. For me and my students, that means short, fun, and often silly videos that help deliver content or review and reteach information. The more my students see me acting silly on camera (as you will see below), the more engaged I find them to be in the flipped lessons. While my lessons are planned, of course, my flipped style is very stream-of-consciousness--I rarely edit, clarify my mistakes on camera, and usually add in a strange fact or joke along the way. You’ll be surprised about how often students bring up the details of your mistakes, jokes, or guest stars from flipped lessons, showing their engagement and attention to detail. Movenote was the first tool for flipped instruction I tried and I still stand by it today. The site supports Google log in and imports slides or Power Point presentations into your videos. On Movenote, users can create videos that feature a presentation and video side by side. For example, I can teach a lesson on video by narrating or presenting the slides I’ve prepared. Movenote videos allow you to reorder slides, pause and restart recording, and to annotate with the help of a laser pointer by clicking on the slides. They do not allow you to edit the video, though, or support presentation animations. I use Movenote to design flipped instruction that more-or-less replaces my in-class lesson. While it’s focused on teacher-centered delivery, it allows students to play and replay as much as necessary. Find Movenote on the website, the Drive App or the GMail Extension. Click here for a sample Movenote flipped video. It’s an older lesson introducing comic books to my students. It’s not necessarily my best, but it’s a good example of what Movenote can do. Screencastify is a Google Chrome extension available for free in the Chrome web store. It creates screencasts and videos with powerful annotation tools. For example, I can record myself in the corner of the screen with a picture-in-picture overlay my own computer screen. While I type, navigate--do whatever--Screencastify can record. It can focus on the entire screen, a specific window, a tab. The annotation tools are awesome, adding both text and different color highlights, and it all saves to Google Drive and YouTube. I use Screencastify to show students and teachers how to do something on the computer. For how to guides, tutorials, and flipped lessons practicing skills, Screencastify is my go to software. I used Screencastify to create a model of a visual analysis project for the graphic novel Maus for my students. Find the video below. My students also used it to create their own screencasts, which were awesome and will be shared in a future post. I’ve said it before and will probably say it again: Google Forms is usually the answer. I’ll often combine a form with a flipped activity like the ones above, so students can share learning, reflect, and check for understanding. I love that forms are already a part of the Google-language my students are so used to and can have all different question types. You can even embed a video into the form. My best Forms strategy is to make two of them for a lesson: Students complete a quick form as a Do Now or anticipatory set, then watch the video, and then another form to review. The beauty of this is in the Google Forms response page: change this page to provide the link to the next activity. This way, students can’t skip steps and are provided everything they need automatically. You can also choose to have students see all of the published responses after they submit, which a great idea to have students push their learning and understanding further. This lesson is designed to introduce students to the graphic novel medium and Art Spiegelman’s Maus II. The activities below must be completed in order and should take approximately 40 minutes in place of class on Monday. If you have any questions, please send an e-mail. FYI: This year, students researched this information for themselves and then used my video as review. Next year, I'll likely have them Jigsaw the information so it's all student-centered and active learning. Watch the Lesson Introduction video here. Complete this form to define comic books. After you complete the form, you can view your peers’ responses here. When you click submit on the form, you receive the link to task 3. Watch the Comics & Maus Introduction video (the link is in your form response page). You will find the link to this video after you submit your form response above. Find an online source that explains a benefit of reading or studying comics. Share that link on our Google Community. List three reasons why people study comics in your packet using my video and/or your own research. Read the summary of Maus I at the end of your packets. The title says three but here’s a bonus: EdPuzzle. I haven’t tried EdPuzzle yet, which is why I’m not writing more, but I’m very excited about it. With EdPuzzle, you can find, edit, or create a video and include questions to check for understanding right in it. EdPuzzle also connects to Google Classroom, making it easier to assign work. I really want to explore EdPuzzle and plan to try it in my classroom and write about it in the next few weeks. Not all flipped activities need to be tech-focused, but if you want to you use technology to enhance the work students do in or outside of your classroom, you can't go wrong with these tools. The more instructional time you can use in your classroom to practice skills and work with students the better, and flipping helps solve the problem of time and space. Share your favorite flipped resources in the comments or on Twitter @MrSchoenbart.